UPDATE (12:45 p.m.): According to the NCAA, these financial documents have always been readily available online. The NCAA has even offered up a link to their most recent financials to prove that they're "not hiding any money." We're stil waiting for clarification from the NCAA on other documents found online. These files were obtained from the membership side of the ncaa.org website, to which 30,000 people have access. These files are not password-protected, nor have we made any attempt to make them so in recent days — they remain available, as the information contained in them has been public for years in both our Membership Reports and our filings to the federal government. Deadspin could have obtained this information as easily with a call to our press office — our 2010 Membership Report is available at http://catalog.proemags.com/publication/0a…, and the financial statement begins on page 52. And now we're passing them along to you. Of note: the bulk of the NCAA's revenue comes through college basketball, particularly March Madness. 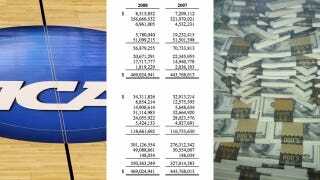 The NCAA brought home $636.2 million in revenue in 2008, which is one hell of a figure for essentially one month of basketball. $359 million of that went back to Division 1 schools, and nearly $230 million more went to staging championships, competitions, and programs in all three divisions. That left $26 million for the NCAA's "management and general," and another $24 million in profit. You'll see also, that as of 2008, the NCAA had $356 million invested in various financial markets. The NCAA's sitting on a lot of dough. We'll have more analysis for you later today, but, for now, peruse the documents freely.